To celebrate the launch of Jack Link’s, the American snack brand, in Tesco Express stores all across the UK, they sent me a squishy envelope full of them. Now, I *think* I’ve tried beef jerky before (it was a while ago) and it wasn’t very nice; imagine eating a bit of your shoe – it was tough and dry and I didn’t need it in my life. So what was this one like? With the rise of paleo eating and people looking to snack more healthily, beef jerky makes sense. For a start, it’s protein-heavy (good for all the gym-bunnies out there), easy to carry around (good for busy, hungry people) and doesn’t need any preparation (good for people who snack on the go). At just over 75 calories per portion, it would also fit well into those doing the 5:2 diet. I should point out here, that I’m not an advocate of any ‘diet’ and believe common sense and education should prevail. Jerky is traditionally made from lean meat which is salted to inhibit bacterial growth and drying over long periods of time at low temperatures. 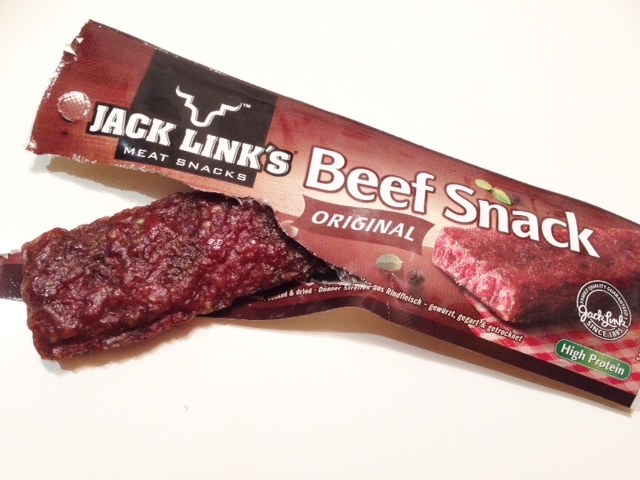 In Jack Link’s beef jerky, beef is the main ingredient with sugar being the second. In terms of eating it, it resembles a flattened peperami. Unlike the jerky I had before which looked like dried muscle (gross, I know), this seems to be softer and doesn’t have any noticeable muscle fibres which suggests to me that it’s been processed, chopped and formed into a shape. The flavour is Original and reminds me a bit of BBQ ribs, with a smokey aftertaste. The protein content for one pack is just under 7g and sugar is just over 5g. It also contains sodium nitrite (it inhibits bacterial growth) which isn’t uncommon in cured meats (including bacon) and has been linked to several health issues so I generally try to avoid eating many products with this in. It also contains soy protein, which is a form of MSG that can cause some reactions including headaches and sweating and in a mouse study, animals that were given MSG had an increased appetite by up to 40%. As a snack, I can’t deny that it tastes good, even moreish. I’ve had to move the rest of the packs to the other side of the room as I could easily munch my way through them (damn that MSG!). I’m a little disappointed with the protein levels in this but if I were hungry for a snack and this was on offer, I certainly wouldn’t say no. However, everything in moderation – I’d consider these an occasional snack rather than an everyday addition. If you’re keen to try Jack Link’s beef jerky for yourself, you can even do so for less (just to see if you like it). Normally retailing at £1.30 per 25g portion, if you download the coupon on their Facebook page (find it on the Coupon tab), you can get yourself one for 80p when you pop down to Tesco Express. Bargain! And it’s a lot healthier than the chocolate bar you could also get for that same amount of money.